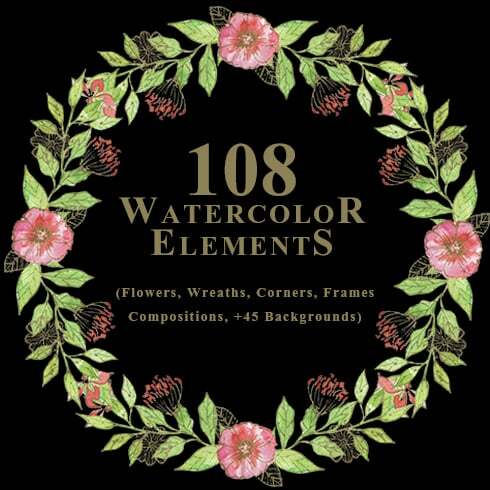 This is the collection of floristic wreaths, compositions, corners, frames, floral&foliage elements and backgrounds. SO WHAT DO YOU GET? PNG&PSD files (300dpi), hand drawn watercolor graphic elements, each element on an individual png with transparent background. If you’re a graphic designer focusing on numerous projects simultaneously, you understand the importance of the entire package of design components available at hand. Hunting for them one at a time, you spend whole lot more time and expense as a result. To get all the needed components in one package, we advocate experimenting with graphic bundles. A bundle can be described as a assortment of digital components meant for graphic design, priced at thousands of dollars, yet sold at a discounted price tag for a very limited time. 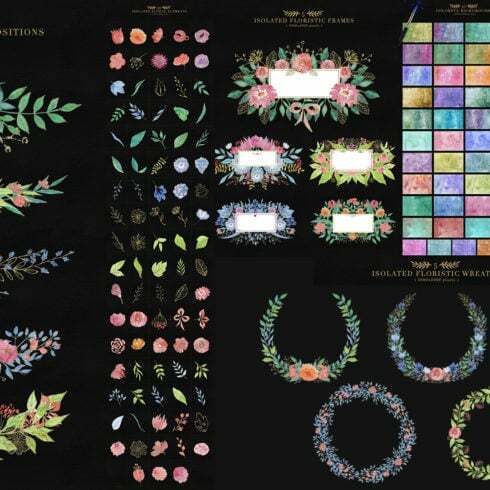 Any ways to make Collection of Floristic Cliparts even more cost-effective? Ok, I am aware they are already cost-effective, but there’s still some place for saving. If you share this page via social websites – you immediately get the 5% discount for any of the graphic deals you like. That is a quite simple way of getting a professionally developed tools for less money. 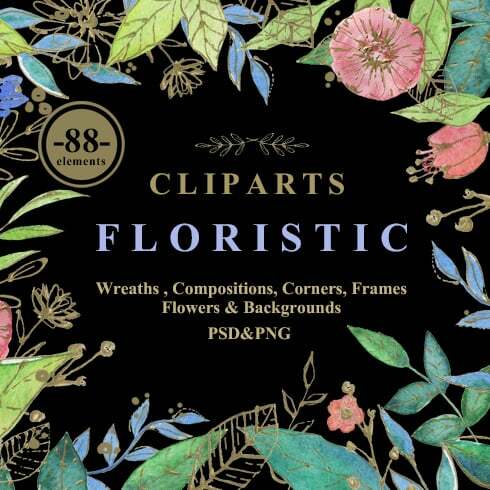 What’s the point of using Collection of Floristic Cliparts? The benefits of graphic deals for graphic designers are usually quite obvious. But if you are new to those elements and now have questions, the following information and facts will probably be useful for you. Along with a great number of the components in a single pack, the collection provides you with an opportunity to use different of them for many different projects. What’s more, the price is often greatly reduced which lets you save some money, yet get the entire set worth hundreds of dollars. The assortments of components gathered into a graphics package are often sorted in accordance with their purpose and kind. There will probably be deals with infographics, wedding invitation templates, business card templates, icons and mockups, etc. On top of that, you will likely find graphic packages particularly for St. Valentine’s Day, Halloween or Christmas. The package deals of logo templates, icons, patterns and fonts are available at your disposal. Furthermore, you may find packages of WP templates, training and ebooks, resume templates, ppt slides, and other elements. If you feel as if you have lost track of time when researching different resources and components for your current graphic design projects, it is a high time to explore MasterBundles. It is a platform offering the most widely used tools (graphics, icons, fonts, presentations etc.) for designers, online marketers, and web developers at an affordable price for a very limited time. In order to not miss major information regarding the upcoming promotions, we advise following our blog and signing up for the newsletter.